Colgan volleyball is 27-0 on the season. 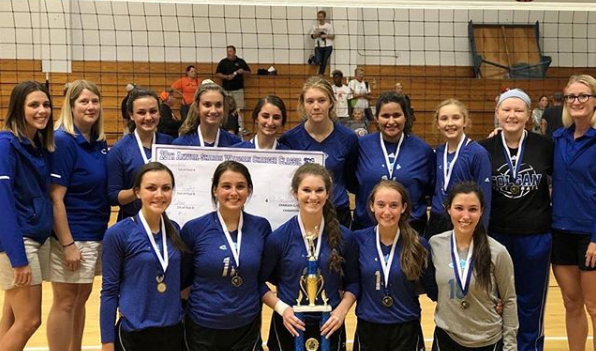 The Craw-Kan "Your Community Technology Partner" Team of the Week from Southeast Kansas is the St. Mary's Colgan High School Volleyball Team. The Panthers, led by head coach Cathy Oplotnik, are 27-0 on the season and the #1 ranked team in 2A this season. Millie Stockard, Kaitlin Crossland, Kenzie Venneman and Emily Dechant are all averaging at least two kills per set.Stockard leads the team with four kills per set while Dechant is hitting .424. Crossland leads the squad with 61 aces, while Venneman and Dechant each have 25 blocks. Sophia Piccini is leading the team in digs with 11.8 digs per match. Cecelia Stockard leads SMC in assists on the season 7.6 per match. Colgan is hitting an impressive .326 as a unit with 12.9 kills per set. Only two matches have went to three games this year in the 27 matches. One of those with previously undefeated Indpendence this week (2-1). The Panthers went 6-0 over the weekend with wins over Uniontown, Coffeyville, Labette County, Cherryvale, Southeast and Independence. Craw-Kan and Sports in Kansas would like to congratulate the Panthers on their 27-0 start and #1 ranking so far this season. SMC is back in action on Tuesday against Columbus.